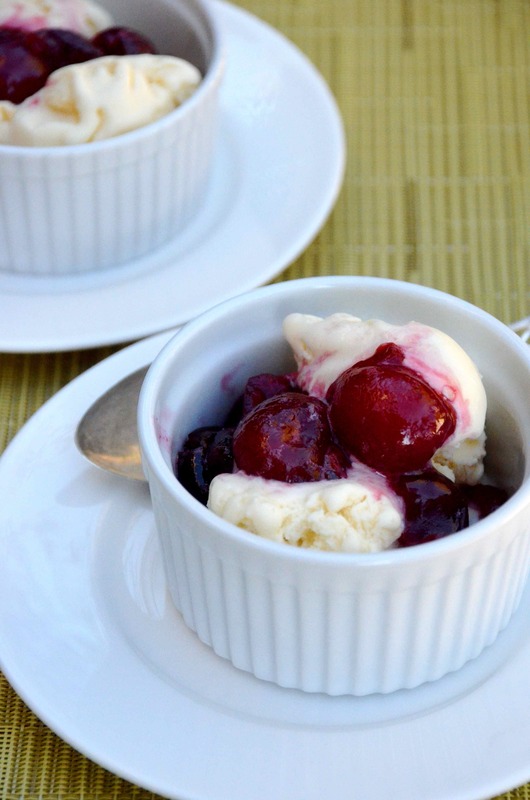 Life’s a bowl of cherries – especially when you’re enjoying the simple pleasures of homemade cherry compote. It is impossible for me to resist a summer roadside stand calling out, “Fresh, local cherries!” Faced with an overflowing basket of beautiful, bright red gems, we had ample opportunity to experiment with this simple summer fruit. One of our favorite treats is to drizzle warm berry compote over homemade vanilla ice cream or yogurt. Why not give it a whirl with cherry compote? 1) Wash and pit the cherries. See this easy trick for how to pit cherries without a pitter. This part is a little messy, but great fun for the kids! 2) Add the water and honey to small saucepan. Cover, bring to a boil, then reduce heat to medium and simmer until thin syrup forms. About 7 minutes. 3) Add the cherries. Cook an additional 5 minutes, stirring occasionally. Cook longer for a more jam-like texture. 4) Serve warm over homemade vanilla ice cream, or cool completely and add to your favorite yogurt parfait. Crunch a Color Kids Vote: Sweet! What we liked: Pitting the cherries was the best (and messiest) part of this adventure. Be sure to wear clothes that can handle a stain or two! We also reserved a portion of our cherries for the freezer. Cherry frozen yogurt, anyone? What is your favorite way to prepare cherries? Share your tips and recipes! Next up: Our local farmers’ market is back in full swing! Can’t wait to see what our friends have in store for us this week. Stay tuned! Craving more new recipes to try? Catch up on last week’s recipe: Steamed artichokes.